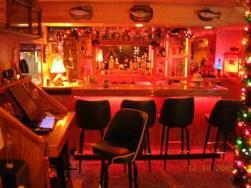 Your bar room wouldn’t be complete without a cool jukebox. Modern music hardware is great but with it’s tangle of wires, speakers, subs and power adapters, it’s not always pretty. Pack everything into this cabinet and get the clean, open fabric front that allows all sound to pass through clearly without seeing the mess. 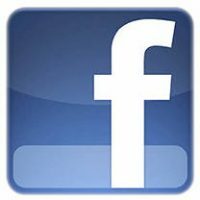 You can pull up a bar stool and set your drink down while you cue up songs from your entire music collection or online services like Pandora. 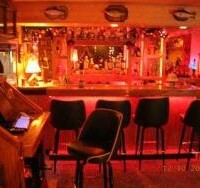 This jukebox cabinet also matches the general design of our home bars. Cabinet houses all your sound amplification and computer equipment. Front is covered with a breathable speaker cloth to conceal equipment, allowing air circulation. 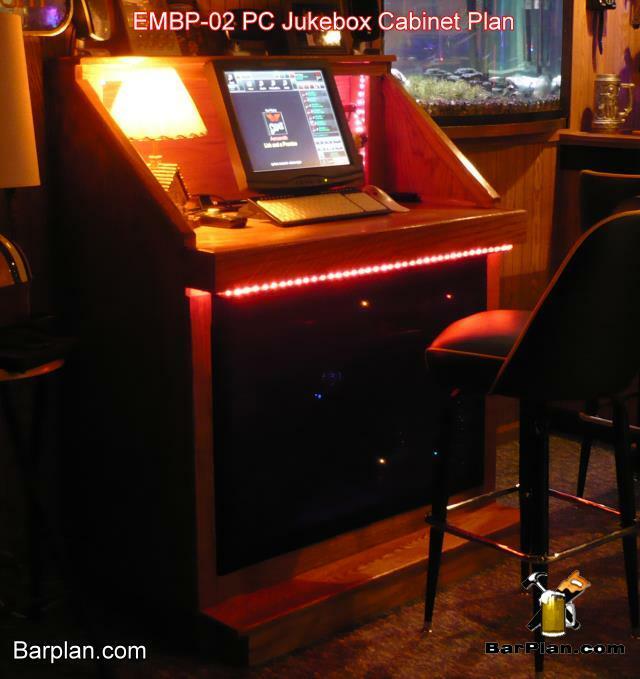 Since home bars can be dimly lit, adding a lighted key board, a trackball or a touchscreen monitor will really enhance the jukebox experience. 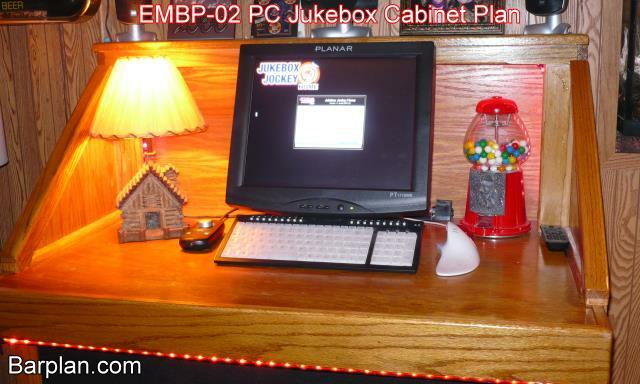 Join the site and start building this cool jukebox today! 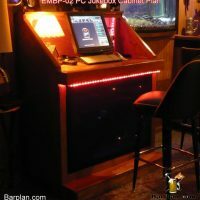 The jukebox plan shows you how to build a great looking PC cabinet that mildly resembles (in it’s outline) a 70’s era jukebox. You can use a touch screen and Juke Box software to make it just like the new all digital jukeboxes at the local bar or nightclub. 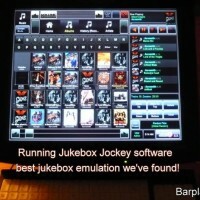 Check out our recommended jukebox software list below. 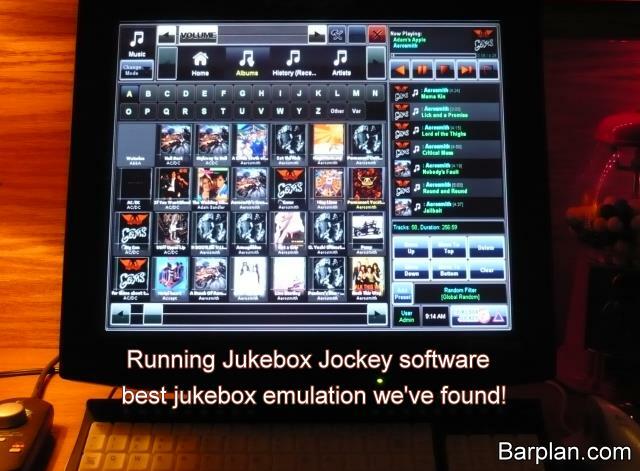 For many years we have recommend Juke Box Jockey software for getting the best look and feel of a digital music station. They even recommend our jukebox cabinet plans! 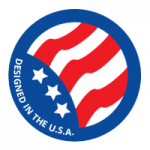 Sadly, JJ no longer sell to US customers. However, times change fast and in 2018 there are many other options. 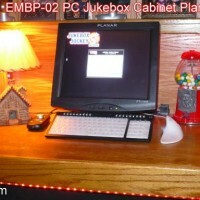 Jukebox software not included with site access membership. 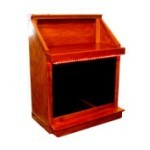 And yes, this Jukebox Cabinet design is included with your membership.